This guide will help commissioners to bring service users and staff together to improve healthcare services. 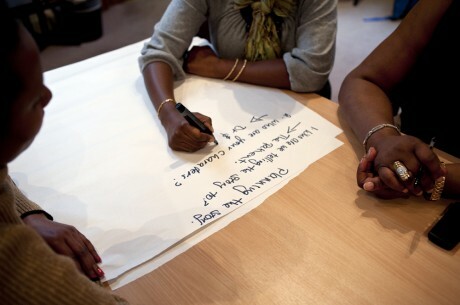 The guide draws on learning from a three year project, Beyond Consultation, which invited young Africans to help shape sexual health and HIV and AIDS services in South London. Beyond Consultation turned the usual health consultation process on its head – inviting seldom-heard service users to help set the agenda, rather than following a consultation exercise already designed by health providers. UK National Health Service staff also took part. As a result of their input, we gained a comprehensive insight into the key sexual health and HIV issues facing service providers. Health is related to other forms of social exclusion. People living in England on low incomes and in poor housing are more likely to experience poor health. Black Africans make up 5.5 per cent of London’s population but comprise 32 per cent of those newly diagnosed with HIV. Given this intersection between poor health and social inequality it is important that service user engagement processes consider the wider social and structural barriers that prevent people from maintaining their health. Engaging with minority groups is one way for health providers to ensure their health needs can be met. Accompanying the guide are materials produced by participants during the Beyond Consultation project. These will be useful to commissioners and staff working in sexual health and HIV services as they provide insights into the health needs and communicate the priorities of the participants. This guide is being launched at a crucial moment for the UK National Health Service. A bill is going through parliament which will lead to the significant restructuring of health services and changes to the commissioning of healthcare. These changes will have a direct impact on vulnerable and seldom-heard groups and it will be important for a whole new set of commissioning bodies to listen to and work with these groups to ensure that newly structured services will meet their needs.